Not only does the BT 45 planting auger have a dependable and powerful engine, it's also lightweight and comfortable to use thanks to an advanced anti-vibration system. Ideal for mass flower plantings or deep root fertilization, this specialized small landscaping auger features a compact, streamlined ergonomic design making it easy to operate. 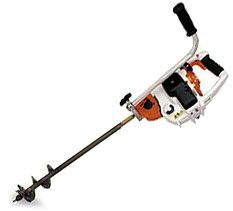 ** Please call us for any questions on our bulb auger gas rentals in Fairview Heights IL.